This book is one of the amazing Australian animal series. 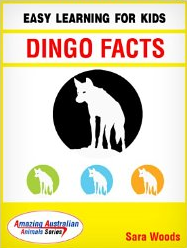 It will enlighten the reader about what kind of animal a dingo is, where it lives, what it eats, how it moves and breeds, how it is threatened, and why it is important. The book packs a lot of information in thirty-four pages. While the author targets the book as a read aloud for younger children as well as an independent reader for older children, I think it more appropriate for the latter group. Unfortunately, my travels have not yet taken me to Australian so I am unfamiliar with this animal. Looking at the photos, I immediately thought of a gray wolf and later learned from the author that the dingo is a subspecies of that animal introduced to Australia by seamen about 4,000years ago. I was fascinated to learn that dingoes are double jointed at all their joints, and that they use their paws as we do our hands. They can even open door knobs. Their ears stand straight up and can rotate backwards; they can rotate their heads 180 degrees for better vision. Most dingoes are monogamous and will mate yearly averaging four to six pups for about ten years. The mother will eat, swallow and regurgitate food to feed young much like a bird. Landowners and hunters are the biggest threat to the dingoes, but crocodiles, snakes, and lack of food and water also factor in their survival. More contact with domestic dogs as urban sprawl progresses could eventually lead to extinction. Farmers who see them as a threat have engineered the world’s largest fence (3,488 miles) to protect sheep and farm lands. But dingoes are special animals because as the only native dog to Australia, they are apex predators at the top of the food chain who protect many smaller mammals and the native natural grasses. Some areas of Australia have set up sanctuaries to protect the dingoes. This series will eventually include eighteen books about Australian animals. It certainly makes an excellent, well-organized reference source for classrooms in the elementary grades and libraries. Teachers could also use many of these books in science units comparing and contrasting with other animals. Highly recommended for children age seven and up. Adults who read these books to children will find themselves being entertained and informed as well. Hubby was at a conference in Australia a while ago and went on a tour where he saw some dingoes. After hearing his experiences, we both have enormous respect for animal conservation efforts in Australia. This just reinforces my belief. thanks for sharing this series on KidLit BlogHop! I agree….all countries need to follow Australia’s example. Glad you enjoyed the post. It’s incredible that dingoes can turn door knobs, that is certainly something I didn’t know. Thank you for sharing this book on the hop. I also am looking forward to more books like this one. Wow! I am completely impressed by dingos now. As an expat currently living in Sydney, Australia I need to read this entire series with my son to better understand the unique animals that live on this continent. Thanks for sharing this review and I look forward to posts on future editions. Thanks for reading…..I am eagerly awaiting more books in the series as well. Double jointed dingoes wow. They’ll see their predators coming. This series does sound amazing! Thanks for bringing it to our attention, Barbara. Can’t wait to hear about the other very unique Australian animals! I certainly did not know any of this…thanks for the review!